An immovable obstruction is an artificial object on the course that cannot be moved (e.g. a building) or cannot readily be moved (e.g. a firmly embedded direction post). Objects defining out of bounds are not treated as obstructions. An abnormal ground condition is casual water, ground under repair or a hole, cast or runway made by a burrowing animal, a reptile or a bird. Except when the ball is in a water hazard, relief without penalty is available from immovable obstructions and abnormal ground conditions when the condition physically interferes with the lie of the ball, your stance or your swing. 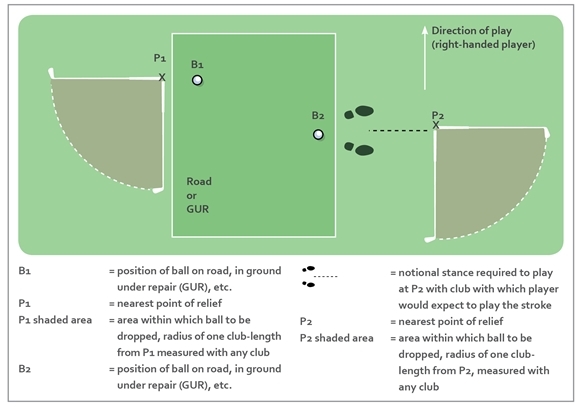 You may lift the ball and drop it within one club-length of the nearest point of relief, but not nearer the hole than the nearest point of relief (see diagram below). If the ball is on the putting green, it is placed at the nearest point of relief, which may be off the putting green. There is no relief for intervention on your line of play unless both your ball and the condition are on the putting green. As an additional option when the ball is in a bunker, you may take relief from the condition by dropping the ball outside and behind the bunker under penalty of one stroke. The following diagram illustrates the term “nearest point of relief” in Rules 24-2 and 25-1 in the case of a right-handed player.